The HS50 provides exceptional comfort for hours of gameplay and legendary CORSAIR build quality, ensuring long-term durability. Precision tuned 50mm neodymium speaker drivers deliver superior sound quality with wide range and accuracy, while a fully detachable Discord-certified microphone and on-ear volume and mute controls make on-the-fly adjustments easy without pulling you out of your game. 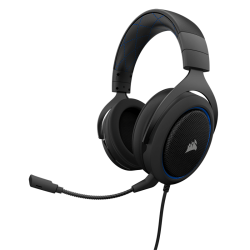 Connecting via a 3.5mm connector for wide compatibility and available in carbon black, green or blue trim, the HS50 brings award-winning CORSAIR quality audio to all gamers, whether they play on PC, console or mobile. Whether you play games on a desktop, on a couch or on the train, nothing should come between you and the action. With adjustable memory foam earcups, the HS50 is built to provide comfort so exceptional that you forget it’s even there. Long-gone are the days of clunky gaming headsets that sound as cheap as they look. With minimalist styling, subtle stitching accents aluminum construction, a durable headband and specially tuned 50mm neodymium speaker drivers, the HS50 looks great and sounds even better. Gamers demand great audio wherever they go, be it from their PC, console or mobile device. With a universal 3.5mm connector, it’s easy to connect the HS50 to your PC (via included Y-cable adapter), PS4, Xbox One* or phone, and with a fully detachable microphone, the HS50 is perfect for gaming on the go. When you’re ready to sit down and play, the optimized unidirectional microphone reduces ambient noise for enhanced voice quality and is Discord Certified, so your teammates will hear you clearly, no matter how intense the gameplay gets. Bringing legendary CORSAIR build-quality, aluminum construction, and fantastic audio to PC, console and mobile gamers, the HS50 is crafted for comfort, and built for battle. The full line-up of HS50 Stereo Gaming Headsets are available immediately from the CORSAIR worldwide network of authorized retailers and distributors as well as direct from the www.corsair.com webstore. All HS50 Stereo Gaming Headsets are backed by a two-year warranty and the CORSAIR worldwide customer service and technical support network. For up-to-date pricing of the HS50 Stereo Gaming Headset, please refer to the CORSAIR website or contact your local CORSAIR sales or PR representative.